A kick, a slap, a punch, a red card and some cheeky goading of rival supporters, Cristiano Ronaldo covered off a number of football crimes on Saturday. The 29-year-old - voted the world's best player when he was awarded Fifa's Ballon d'Or this month - lashed out with seven minutes remaining of Real Madrid's 2-1 win at Cordoba. His reckless kick from behind on Edimar was followed by a slap to the Brazilian's face and Ronaldo could have seen red earlier when he appeared to land a right-hook on defender Jose Angel Crespo. That sin went unpunished but after being dismissed for the ninth time in his career, the Portuguese dusted off his World Club Cup winners' badge as rival fans taunted him on his way to the tunnel. A show of defiance maybe, but a contrite apology swiftly followed: "I apologise to everyone and especially to Edimar for my thoughtless acts in today's match," said Ronaldo. 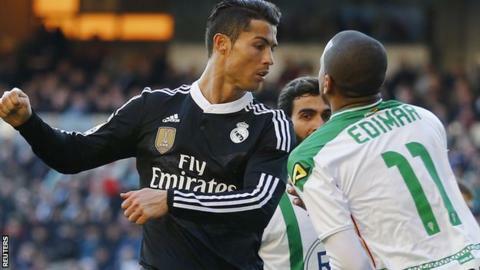 It is not the first time the so-often slick and cool Ronaldo has engaged in an act of violence and three of the four red cards shown to him in La Liga have now been for fighting with opponents. Gareth Bale - a player booed for not passing to Ronaldo in recent weeks - netted a late Los Blancos winner to nullify the impact of the red card. Referee Alejandro Hernandez Hernandez did not deem the act to be violent conduct, so Ronaldo is unlikely to serve a three-game ban which would take in the Madrid derby on 7 February.